There are multiple ways to merge two stitch two graphs together. Next to calculating all possible solutions or use evolutionarty algorithms bidding is a possible way. The nodes in the container, just like in a Multi-Agent System , pursue a certain self-interest, as well as an interest to be able to stitch the request collectively. Using a english auction (This could be flipped to a dutch one as well) concept the nodes in the container bid on the node in the request, and hence eventually express a interest in for a stitch. By bidding credits the nodes in the container can hide their actually capabilities, capacities and just express as interest in the form of a value. The more intelligence is implemented in the node, the better it can calculate it’s bids. The algorithm starts by traversing the container graph and each node calculates it’s bids. During traversal the current assignments and bids from other nodes are ‘gossiped’ along. The amount of credits bid, depends on if the node in the request graph matches the type requirement and how well the stitch fits. 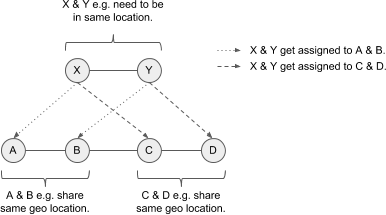 The nodes in the container need to base their bids on the bids of their surrounding environment (especially in cases in which the same, diff, share, nshare conditions are used). Hence they not only need to know about the current assignments, but also the neighbours bids. For the simple lg and lt conditions, the larger the delta between what the node in the request graphs asks for (through the conditions) and what the node in the container offers, the higher the bid is. Whenever a current bid for a request node’s stitch to the container is higher than the current assignment, the same is updated. In the case of conditions that express that nodes in the request need to be stitched to the same or different container node, the credits are calculated based on the container node’s knowledge about other bids, and what is currently assigned. 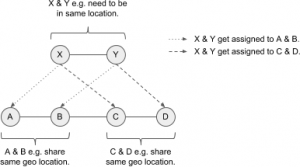 Should a pair of request node be stitched – with the diff conditions in place – the current container node will increase it’s bid by 50%, if one is already assigned somewhere else. Does the current container node know about a bid from another node, it will increase it’s bid by 25%. Let’s assume A bids 5 credits for X, and B bids 2 credits for Y, and C bids 4 credits for X and D bids 6 credits for Y. Hence the group C & D would be the better fit. When evaluating D, D needs to know X is currently assigned to A – but also needs to know the bid of C so is can increase it’s bid on Y. When C is revisited it can increase it’s bid given D has Y assigned. As soon as the nodes A & B are revisited they will eventually drop their bids, as they now know C & D can serve the request X, Y better. They hence sacrifice their bis for the needs of the greater good. So the fact sth is assigned to a neighbour matters more then the bid of the neighbour (increase by 50%) – but still, the knowledge of the neighbour’s bid is crucial (increase by 25%) – e.g. if bid from C would be 0, D should not bit for Y. The ability to increase the bids by 25% or 50% is important to differentiate between the fact that sth is assigned somewhere else, or if the environment the node knows about includes a bid that can help it’s own bid. Note this algorithm does not guarantee stability. Also for better results in specific use cases it is encourage to change how the credits are calculated. For example based on the utility of the container node. Especially for the share attribute condition there might be cases that the algorithm does not find the optimal solution, as the increasing percentages (50%, 25%) are not optimal. The time complexity depends on the number of nodes in the container graph, their structure and how often bids & assignment change. This is because currently the container graph is traversed synchronously. In future a async approach would be beneficial, which will also allow for parallel calculation of bids. The bidding concept is implemented as part of the graph-stitcher tool.